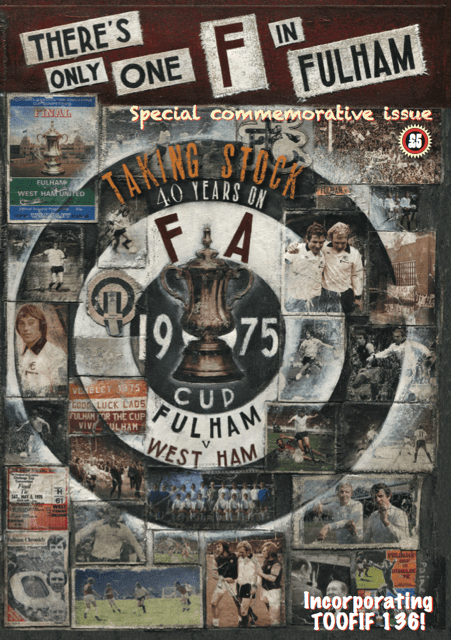 The season’s final issue of TOOFIF goes on sale today – as usual we can expect it to be full of marvellous Fulham content – but the end of the season also marks 40 years since Fulham reached Wembley in what is our only FA Cup Final to date, and to recognise this marked achievement in our history TOOFIF celebrates with an extra-huge edition. There’ll be interviews and images galore honouring the occassion and those behind it, so make sure you go and pick up a copy: it’s longer/better/funnier than a programme, and you’ll be supporting a true Fulham institution, a publication made by fans for fans. You can find it being sold for just a fiver outside the Hammy End – or just follow the sound of ‘There’s Only One F In Fulham’ being bellowed from outside the ground! Actually there was a hell of a lot lot worth celebrating back in 1975 and, in fact, today – even if not the 2-0 defeat itself. Our route to Wembley was full of twists and tales and our set-up was awash with characters, one or two, alas, no longer with us. So why not? Late’s give it a go. And with that, TOOFIF took the plunge and decided to go for it. On a fairly minor scale, of course – no point in simply regurgitating all the (excellent) stuff that had been written before. No, best to keep it fairly modest, although as punchy as possible. And then the whole bloody thing took off! It’s been utterly extraordinary as to how the word got around – and the response has been every bit as wonderful. It’s been great fun interviewing the guys today about the events of forty years ago. But more than fun, it’s been illuminating too. No one has been more open about the events of the big day than John Cutbush, tracked down after 20 years of unintentional exile from his former teammates. Although Peter Mellor comes close! The latest on Jimmy Conway is tough to read while John Mitchell recounts his high points with Aussie-based Fulham fan Paul Steele. Alec Stock’s daughter Sarah champions her Dad’s footballing exploits, not least leading Fulham to Wembley while Les Strong underpins the whole thing by popping up here there and everywhere. Except, sadly, on the famous Wembley turf in 1975. So “fairly modest yet punchy” became a bumper special, and the biggest-ever TOOFIF given its 128 pages and upscale in dimensions (it’s a perfect bound B5 issue, rather than A5 for those who know about such things). And graced by the wonderful photos of Ken Cotton and supreme artwork by Paine Proffitt (check out the front cover for starters!). The enthusiasm for the project by all those who’ve contributed – not least the players of the day (including those from West Ham) plus former coaches and Sarah Stock – pushed the the wow factor to seriously high levels. I’m not normally one to crow, but I’m seriously proud of this particular effort – and it certainly was an effort getting everything together in such a short time-frame. However, I’m pretty sure that the enthusiasm of all those concerned shines through and makes for a seriously good read. Not that Strongy is ever serious. He probably did a stand-up routine in the High Court on the morning of the big match. Great that the FST came aboard, and their ad graces the inside back cover opposite Ken Coton’s classic image of Mooro and Mullers consoling each other as they headed for the Wembley dressing-rooms.